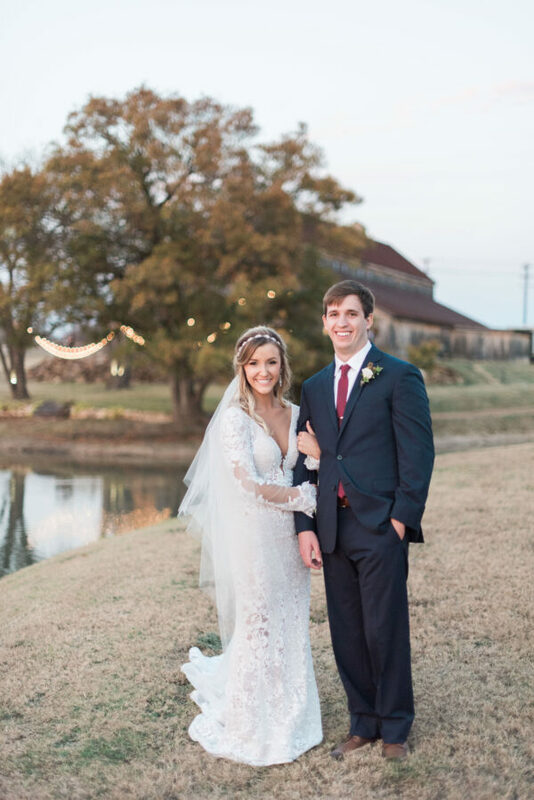 Jessica Hunter Hayes and Austin Curtis Lightle married on November 25, 2017 at the Venue at the Waterstone. The bride, 23, works in digital marketing for Longview Regional Medical Center. She is a Colorado State University alumna with a degree in journalism and digital media studies. The groom, 24, works for KSA Engineering. He graduated from Colorado School of Mines with a degree in civil engineering. (Engineering seems to run in the family—both the father-of-the-bride and father-of-the-groom are in the business). The couple lives in Longview, Texas. Unlike most couples, Jessica Hayes and Austin Lightle met in middle school. They began dating on April 10, 2008—when Austin (known by many as “Goose”) asked Jessica to the 8th grade dance. The two had been dating for ten years before getting engaged. Austin surprised Jessica with a fireside proposal, along with a new golden doodle pup named Charlie, who was sporting a name tag that asked the big question. Austin asked Jessica to look at it to make sure he spelled “Charlie” correctly, and as she read “Will you marry me?” he got down on one knee. The ceremony took place outside at the Venue at Waterstone. Austin’s uncle, Greg Maxwell, officiated the wedding. He started the ceremony off with a touching speech. A reception to follow in the spacious barn, with fall décor and a color palette of navy, merlot, and gold. The bride wore a bohemian bridal gown by BERTA from Bridal Boutique, which set the tone for a modern yet relaxed wedding. See more with the wedding hashtag #ChangingHerTitleToLightle and the wedding video here. Hi, I am the mother of the bride and am wondering how I can get a couple copies of your magazine with Jessica and Austin’s feature in it. Any help would be greatly appreciated.